Where do I use my GoNutrition voucher code? Browse for an Offer of your choice at NetVoucherCodes. Follow the link through to the Go Nutrition Homepage. Fill up your online shopping basket with items you wish to purchase then go to the checkout. Enter your promo code into the box beneath your order and click ‘Use Code’. Select ‘Checkout Now’ to complete your order. "By referring a friend, you will both earn credit towards your next purchase!" Oliver Cookson founded the popular brand ‘My Protein’ in 2004 and after years of growth and success, decided to broaden his empire, thus selling My Protein and created Gonutrition in 2011. 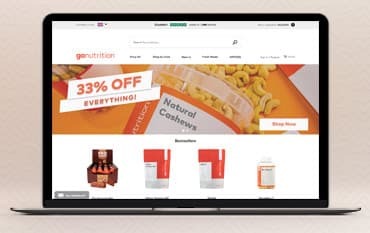 With a passion for providing the highest quality, low-cost supplements and food designed for the health market, Gonutrition was and still remains a huge competitor in the online health retailer market. Their dedication to quality includes a 100% Transparency commitment in their products meaning everything is labelled with complete integrity and contains no cheap fillers or amino acids. You will know exactly what you’re getting at Go Nutrition as their Quantitative Ingredient Declaration Labels will provide the percentage of all ingredients inside each and every product. Go Nutrition are also providers of some of the cheapest protein products helping customers bulk up for less. Shopping with a Go Nutrition Discount Code could help slash those costs even further and speed up your bulking, weight loss or fitness journey even more! With this in mind, quality is not compromised. Uncover the wide array of categories and products available online at Go Nutrition and start fulfilling your nutritional needs today. 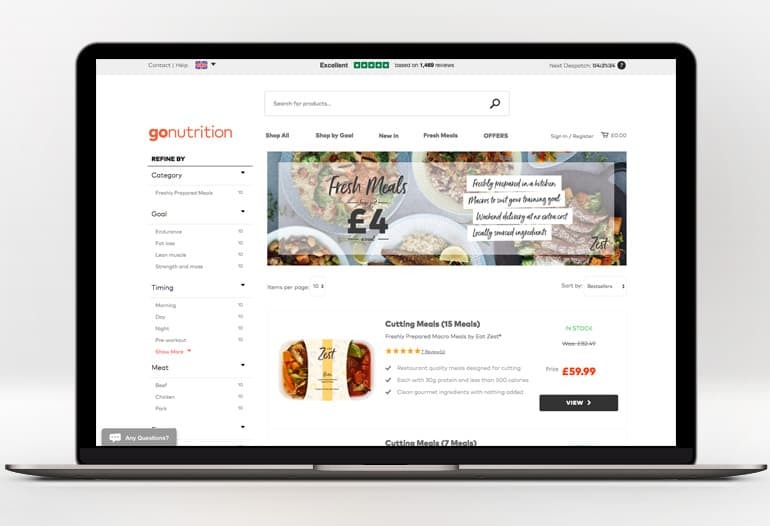 You can enjoy all the products you love and find new items to compliment your fitness and nutritional collection by using the simple and easy to navigate Gonutrition website. There is no more scratching your head or becoming frustrating at baffling options and offers, simply enter your age, weight, height, goals and training habits and Go Nutritional will do all the work for you! This means you can find products tailored to your needs. This is great for those who are new to the nutritional world. Many online retailers in the Health & Nutrition sector offer extortionate prices for their products and bundles which can leave you feeling pressured into spending an unnecessary amount! 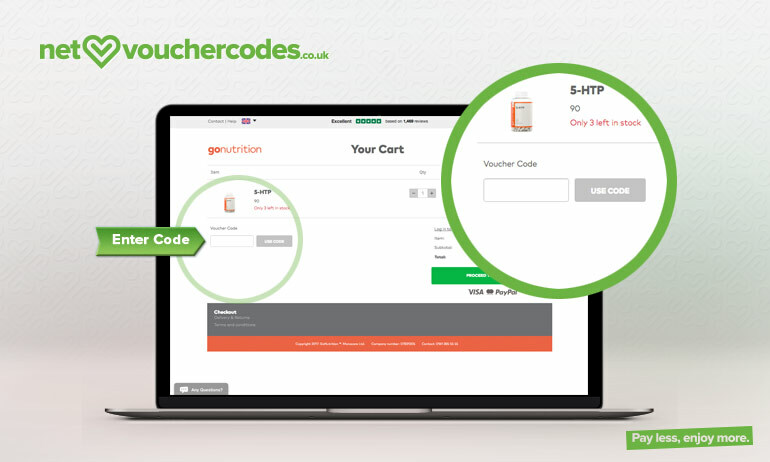 Go Nutrition offer the most affordable prices in the UK for their Meals and Supplements and with the added bonus of a Voucher Code at the checkout, you can grab even more money off your next online purchase. Eating a healthy diet isn’t just about drinking excessive amounts of protein shakes or living off egg whites and kale, Go Nutrition has a wide selection of healthy, balanced and most importantly, tasty meals! Fresh Meals are the best way to consume all the carbs and protein you need whilst being able to enjoy wholesome, delicious recipes. Grab your next bundle of Freshly Prepared Meals and save money with one of our Promotional Codes, whether you’re bulking, cutting down or looking to boost your health, Go Nutrition's tasty selection of Fresh Meals has something for you. Whatever your goal, adding protein and supplements into your diet can have a heap of health benefits whilst also working in conjunction with your body to help achieve your goals. Whether you’re wanting to lose weight, gain muscle or generally add more vitamins to your diet, supplements can help give you the added boost you need. Shop the wide array of products available online at Go Nutrition including Weight Loss supplements, Amino Acids or Fish-Oil capsules alongside protein powders, blends & formulas! There is a whole world of products out there to assist you on your fitness journey and it’s now easier than ever to find what you’re looking for with the smart search tool system. Check out the fantastic collection today and be on your way to achieving your goal faster than you thought. If your item is unopened, you may return it within 14 days of it being delivered. Opened products may be returned within 30 days providing only a few spoonfuls have been used. You will need to pay for the return of the product if you have used more than the amount stated. Alternatively, contact Go Nutrition using their online contact form here.